WATCH: Call of Duty Infinite Warfare Reveal Trailer | Nerd Much? As promised, Activision has delivered the official Call of Duty: Infinite Warfare reveal trailer this morning, giving us our first look at Call of Duty 2016. This first trailer confirms that it will have a sci-fi setting, as was rumored a month ago, and the trailer certainly has a lot of other interesting tidbits to note. For one, it looks like we’re going to be controlling a space jet of some sort at some point, likely during the campaign. We’d have to imagine that it’ll likely make its way into the multiplayer, and we wouldn’t be surprised if we saw it as some sort of DLC (although, that’s just speculation on our part). It confirms the whole Call of Duty in space rumors, at least for a portion of the game. In fact, at one point, it appears as though you’re actually fighting a robot. How far into the future the game is actually set remains to be seen, but we’ll keep you posted on the official word when Activision and Infinity Ward release that information. Secondly, there appears to be a grappling hook of sorts at about 2:20 into the trailer. Please, for the love of all things holy, don’t let that make its way into multiplayer. At the very end of the trailer, we’re given a brief teaser for Call of Duty: Modern Warfare Remastered, which we now know will be available with the Legacy Edition for $79.99, and it will be packaged with the campaign and 10 multiplayer maps. There’s no word on whether or not we’ll be able to buy the MW Remastered on its own, but hopefully, that’s the case. We’re also told that Infinity Ward will host a live stream later today at 10:30AM PDT/1:30PM EST on their official Twitch channel, Twitch.tv/CallofDuty. The Call of Duty: Infinite Warfare release date is set for November 4, 2016 for Xbox One, PS4, and PC. For more updates on all things Call of Duty, stay tuned to Nerd Much for the latest news. 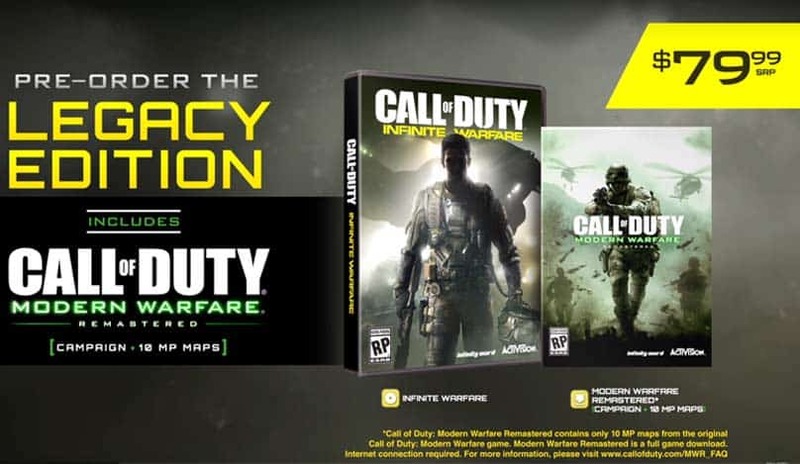 You can preorder Call of Duty: Infinite Warfare here.